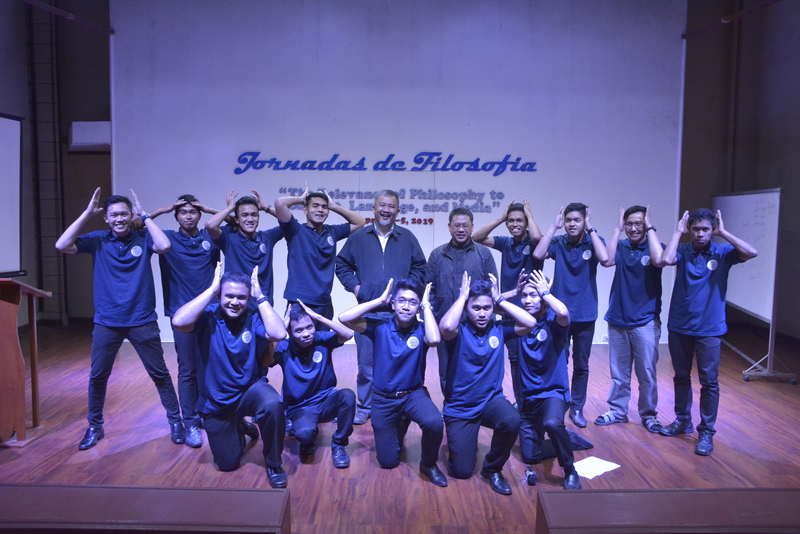 Jornadas de Filosofia may have been on its final day on April 5, 2019, but organizers literally saved the best for last as the set of activities suggested. In the morning, classes were suspended to give way to the exciting Philosophical Quiz Bee and Debate held at the seminary’s mini-theater, starting at 8 AM. In the afternoon after the siesta, formators and seminarians listened to a lecture on Filipino philosophy delivered by a philosophy teacher of one of Ilocos Norte’s most prestigious schools. The morning activities started with the highly engaging quiz bee. Each Fraternidad was represented by five members who battled it out in the Easy, Average, and Difficult rounds concerning stock knowledge on philosophical concepts from the Ancient down to the Contemporary Periods, covering logic, metaphysics, epistemology, ethics, philosophy of religion, and everything in between. At the end of a close contest, La Fraternidad de Jesus Nazareno emerged as third placer, followed by La Fraternidad de Divina Misericordia. La Fraternidad de Cristo Rey brought home the top prize as they bested all teams in practically every round of the contest. The winning team was composed by Brs. Audel Ken V. Santillan, Jess BhowenTenorio, Emmanuel Palmin, Jesse Meer Alipes, and Alvin Laserna Jr.
After the quiz bee, senior high school seminarians gave everybody a much-needed break as they presented cultural dances from Luzon, Sakuting and Pandango sa Ilaw, in the intermission number. The debate, Oregon Oxford style, then followed. Members of the two debating teams this time were randomly picked from the four fraternities and were asked to resolve the proposition whether or not Filipino courses should be required in the tertiary level of education. On the affirmative side were Brs. Emmanuel Palmin, Roque James Sabas, and Stephen Palicdon, who went up against members of the negative side composed of Brs. Kris Marjon Bajao, Jestoni Latagan, and Christian Peralta. Debate adjudicators were the seminary’s English teachers, namely: Ma’am Marisol Afuang, Ma’am Ma. Assumpta Calano, and Ma’am Milanie Dalingay. Winning the debate was the negative side, with Br. Latagan named as the Best Debater while Br. Bajao was named Best Interpellator. The morning activities ended with another intermission number, this time cultural dances from the Visayas, namely, Sinulog and Pinta Flores. Filipino Philosophy: Fact or Fiction? 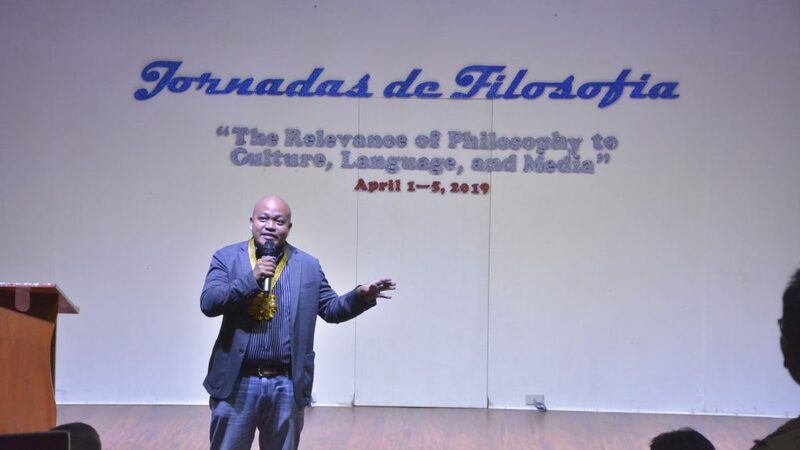 Professor Rex-Belli L. Alejandro gave a lecture on whether or not the Filipinos have had their own Filipino philosophy during the seminary’s Jornadas de Filosofia 2019. In the afternoon, Mariano Marcos State University Philosophy Professor Rex-Belli L. Alejandro, an alumnus of Baguio’s college diocesan seminary, gave a lecture on whether or not the Filipinos have had their own Filipino philosophy. After presenting a long list of related literature from Filipino scholars who had opposing takes on the topic, Prof. Alejandro concluded that Filipinos still do not have their own Filipino philosophy for in the end, Filipinos have not defined the goal of their philosophizing. Br. Paolo Marco Renacia, a fourth year seminarian, said the talk was an eye opener for him for he was made to realize that the practice of Filipino philosophizing, especially in the academe, involves the application of Western concepts and frameworks to the Filipino context. Br. Renacia further related that in doing his thesis, which he successfully defended just a few weeks back, he was basically using Western thought — Habermas’s discourse ethics — as a theoretical framework in settling Filipino labor disputes. After the lecture, a third cultural number was presented by senior high school seminarians. The main performer was a princess dancing the Tinikling with a lover to the delight of everybody. After that came the moment all had been waiting for the entire week: the announcement of individual category and overall winners. The 3rd runner-up in the overall ranking went to La Fraternidad de Sto. Nino while La Fraternidad de Jesus Nazareno was second. The 1st runner-up was La Fraternidad de Divina Misericordia, and the over-all champion was La Fraternidad de Cristo Rey. Caption of Feature Image: The members of Fraternidad de Cristo Rey reign supreme as they are declared overall champions of Jornadas de Filosofia 2019. With them are Seminary Rector Fr. Bernard Ampardo, OAR (back row, fifth from left) and Dean of Studies and Senior High School Principal Fr. Anthony Irineo, OAR.